Author: Simon Candelaresi, David Pontin, Gunnar Hornig at the University of Dundee, Anthony Yeates at Durham University, Paul Bushby at Newcastle University. Plasma motions on the Sun’s photosphere can lead to tangling of the coronal magnetic field lines that are rooted there. The high tangling can generate thin current layers, potential sites of magnetic field reconnection and energy conversion. Here we study the field line tangling induced by these photospheric motions. The solar surface (photosphere) is a highly dynamical and turbulent plasma that exhibits turbulent flows. These are due to convective motions in the outer solar interior that transport heat to the surface. On the surface, this plasma cools through thermal radiation and sinks back where it is reheated. Further up in the solar atmosphere we observe coronal magnetic fields that are anchored at the photosphere. The presence of turbulent photospheric flows means that the field lines in the corona are continually reorganised, twisted and even braided. Such changes in the magnetic field’s topology have implications for energy transport from the photosphere, the formation of thin current layers in the corona, and subsequent dynamic phenomena involving magnetic reconnection. From observations we know the time evolution of the line of sight magnetic field on the photosphere. Using the Fourier Correlation Technique [1, 2] we can extract the horizontal component of the plasma velocity on the photosphere. Of course, observations of the solar magnetic field are strongly limited in resolution. Furthermore, the inferred horizontal motions strongly depend on the method used for extracting the horizontal velocities. Therefore, we also consider here velocities obtained from magneto-convection simulations [3, 4], which are known ‘exactly’. 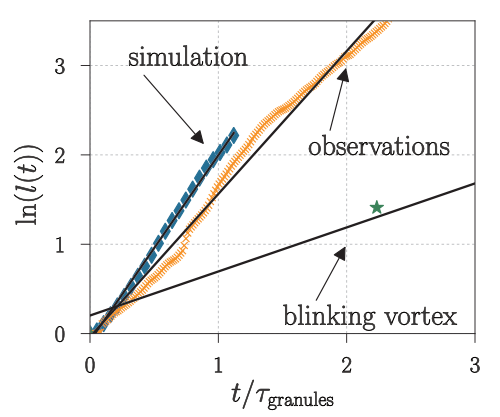 Finally, we compare with a well known benchmark motion that leads to efficient fluid mixing, called the blinking vortex. This consists of two overlapping regions along the x-axis where we apply alternating twisting motions of opposite signs (for details see [5, 6]). As a proxy for the tangling of field lines in the corona, we can measure the mixing of fluid particles by each of our model photospheric flows by following ‘marked’ particles. We mark the particles by using an initial passive scalar distribution of the form c(x, y) = x + y. As the particles move, this distribution will change. The mixing is visualised for the flows from the magneto-convection simulations in Figure 1. There we plot the passive scalar distribution, as the motions turbulently mix the plasma. There is clearly a strong mixing that we will quantify using the winding number and the topological entropy. Figure 1. Movie of the evolution of a passive scalar on the simulated photosphere. If we want to know the efficiency of the winding of the surface motions we need to integrate the velocities of test particles in time. With that we calculate for every flow trajectory the average winding of other trajectories around it which gives us an averaged winding number (here we imagine a domain with three dimensions: the two flow dimensions plus time). Doing this we find mean winding numbers of 0.122 for the magneto-convection simulation, 0.05 for the photospheric observations and 0.0243 for the benchmark blinking vortex. For the observed flows on the real photosphere, this means that the average winding increases by an angle of 0.63 degrees per hour. These calculation involve a normalisation in order to obtain dimensionless numbers. For details refer to . Although the used benchmark exhibits a highly efficient mixing, the simulated and observed photospheric motions are more efficient in mixing the fluid. Figure 2. Movie of the evolution of a material line that is being advected by the simulated photospheric motions. Figure 3. Logarithmic material line length in dependence of time as it is being advected by the motions together with linear fits to compute the finite time topological entropy. Another way of quantifying the tangling of a 2d fluid or 3d magnetic field lines, is the finite time topological entropy [7-9]. It measures the exponential stretching rate of a material line that is being advected by the fluid. An example of such an advected material line is shown in Figure 2. Similar to the experiments using the winding number, the simulated convection layer and the observations show a high degree of tangling in terms of finite time topological entropy with values of 2.078 for the magneto-convection simulations, 1.598 for the observed photospheric flows and 0.4928 for the benchmark flow (see Figure 3). A Value of 1 means that in the course of one (normalized) time unit (4.696 hours for the observations) a material line is stretched by a factor of e.
The observed photosphere and simulated convection zone are highly efficient in mixing the photospheric plasma – even more so than the benchmark flow, itself known to be a very effective mixing flow. For anchored magnetic flux tubes this means that on the time scale of approximately 3 hours we can expect a similar complexity as seen in the so called magnetic pig-tail braid that consists of alternating positive and negative twisting regions. With respect to the Parker braiding problem our result suggest that the present motions have the potential to lead to highly tangled and braided magnetic fields. Mangalam, A., & Prasad, A. 2017, Adv. Space Res.